The "Angel of His Presence"
"The Angel of the Lord" or "of God," or "of His presence" is readily identified with the Lord God (Gen. 16:11, 13; 22:11, 12; 31:11, 13; Exod. 3:1 6 and other passages). But it is obvious that the Angel of the Lord is a distinct person in Himself from God the Father (Gen. 24:7; Exod. 23:20; Zech. 1:12, 13 and other passages). Nor does the "Angel of the Lord" appear again after Christ came in human form. We see the first appearance of the "Angel of the Lord" in Genesis 16. Abram [Abraham] had been unable to father a son by his wife Sarai [Sarah], so Sarai suggested he try to have a child by her Egyptian maid, Hagar. After Hagar conceived, Sarai became jealous and treated her very poorly. Hagar decided to run away, and she met the Angel of the Lord on a road leading to another town. The Angel comforted her and then sent her back to Abram and Sarai. The Angel advised that her child would have many descendants, but his life would be one of many hardships. 7"The angel of the LORD found her by a spring of water in the wilderness, the spring on the way to Shur. 11And the angel of the LORD said to her, 'Behold, you are pregnant and shall bear a son. You shall call his name Ishmael, because the LORD has listened to your affliction. After the incident with Hagar, God changed Abram's name to Abraham and his wife's name from Sarai to Sarah, as we now know them. Sarah was still without child at this time, as both Abraham and Sarah were too old to conceive a child. However, God blessed them greatly and told Abraham he would father a child with Sarah, even in their old age. After the two angels departed toward Sodom, the Lord [the Angel of the Lord] revealed to Abraham His plan to destroy Sodom and its neighboring town, Gomorrah. Abraham then began to intercede with the Lord on behalf of the righteous people living in Sodom. 23"Then Abraham drew near and said, 'Will you indeed sweep away the righteous with the wicked? 24Suppose there are fifty righteous within the city. Will you then sweep away the place and not spare it for the fifty righteous who are in it? 27Abraham answered and said, 'Behold, I have undertaken to speak to the Lord, I who am but dust and ashes. According to the narrative in Genesis 21:1 20, the Lord was true to His Word to Sarah, and she did become pregnant and bear a child to Abraham, even in her old age. They named him Isaac, which means "laughter". Hagar, the Egyptian maid, also delivered a son whom she named Ishmael according to the word of the Lord in their first meeting. Ishmael was born a few years before Isaac; and when Isaac was weaned, Ishmael was seen mocking the boy. Sarah became very upset with this mocking, and had Abraham send Hagar and her son away. Hagar and the boy wandered in the desert until they ran out of water, and Hagar was sure the boy would die. However, the Angel of the Lord heard Hagar's cries and spoke again with her in the wilderness. He saved Hagar and the boy's lives by miraculously providing a well of water. The destinies of both Isaac and Ishmael were part of God's great plan, though they each played vastly different roles. One of the most powerful illustrations of a father's love for his son and the love of a man for his God is the one of Abraham and Isaac in Genesis 22:7-18. God had requested of Abraham the very thing that He Himself would do centuries later in sacrificing His Son, Jesus Christ. Notice that when Isaac asked where the lamb was for the offering, Abraham told him that God Himself would provide the lamb. This satisfied the curiosity of the young man, but Abraham's words were very prophetic  well beyond what he had possibly imagined them to mean, since God would literally provide the Lamb at a much later date. The Angel of the Lord stayed the hand of Abraham, sparing the boy's life so he could fulfill his destiny in God's great plan. Abraham had proven his obedient love for the Lord. Then, the Lord provided a ram which Abraham and Isaac consequently used for the burnt offering. Throughout Scripture and time, God has been revealing Himself to mankind, sometimes in miraculous signs and wonders. Other times He has chosen to reveal His glory and power in more subtle, less visually spectacular ways. However He chooses to reveal Himself, we need to be ready to receive His Presence in our lives. In the narrative in Genesis 24:7 48, we see how important it was for Isaac to take a wife to accomplish what God had planned for him and his descendants. It was so important that God sent His Angel ahead with Abraham's servant to scout for a potential bride for Isaac. "Jehovah, the God of Heaven, who took me from my father's house and from the land of my kindred, and who spoke to me, and who swore to me, saying, To your seed I will give this land: He shall send His Angel before you. And you shall take a wife to my son from there." (Genesis 24:7 MKJV emphasis added). The servant believed Abraham and even asked the Lord to reveal to him the woman whom God had appointed for Isaac. "Let the young woman to whom I shall say, 'Please let down your jar that I may drink,' and who shall say, 'Drink, and I will water your camels'  let her be the one whom you have appointed for your servant Isaac. By this I shall know that you have shown steadfast love to my master." (Genesis 24:14 emphasis added). In Genesis 32:24-32, we read that "a man wrestled with Jacob" , the "man" being the Angel of God. Although Jacob did not lose the wrestling match, so to speak, God did afflict him with a physical impairment. God also changed Jacob's name to Israel. 24"And Jacob was left alone. And a man wrestled with him until the breaking of the day. 25When the man saw that he did not prevail against Jacob, he touched his hip socket, and Jacob's hip was put out of joint as he wrestled with him. 29Then Jacob asked him, 'Please tell me your name.' But he said, 'Why is it that you ask my name?' And there he blessed him. 31The sun rose upon him as he passed Penuel, limping because of his hip. There is no indication in Scripture that the fullness of the glory of God was manifest while Jacob wrestled with the "man". However, Jacob obviously saw or sensed something spectacular that caused him to exclaim, "I have seen God face to face." Obviously, Jacob did not wrestle with God the Father, but with the pre-incarnate second Person of the Trinity, Jesus Christ. I imagine this same revelation was visible in Jesus during His earthly ministry. This explains how we might see the likeness or image of God and live. 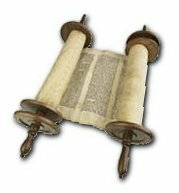 In considering this story and others about the Angel of the Lord, we must never lose sight of the fact that "all Scripture is given by inspiration" (2 Timothy 3:16), meaning that God Himself gave revelation to the writers so as to remove any doubts concerning the events and the pre-incarnate Christ. 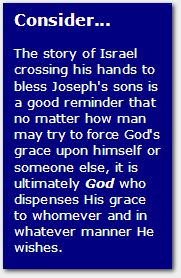 In Genesis 48, we read about Israel [Jacob] blessing his grandchildren, the children of Joseph. Joseph brought the two boys to his father and presented them according to their birth order. However, moved by the Holy Spirit of God, Israel crossed his hands and blessed the children according to God's desire, not their birth order. Notice that Jacob [Israel] said the Angel had redeemed him continually from every evil. This can only be the Lord, for no one has the authority to forgive sins, except God. This was also a chief complaint that the religious leaders and rulers had against Jesus, since He claimed to be able to forgive people of their sins. The next recorded appearance of the Angel of the Lord came several hundred years later when God prepared to deliver His people from slavery in Egypt. 1"Now Moses was keeping the flock of his father-in-law, Jethro, the priest of Midian, and he led his flock to the west side of the wilderness and came to Horeb, the mountain of God. 2And the angel of the LORD appeared to him in a flame of fire out of the midst of a bush. He looked, and behold, the bush was burning, yet it was not consumed. As the Israelites began their journey through the wilderness, God faithfully provided a divine chaperone and protector, His Angel. He gave them light, while at the same time, causing darkness for the enemy that pursued them. God further protected His children supernaturally, as He enabled them to pass through the sea on dry land, while drowning the Egyptians. 25clogging their chariot wheels so that they drove heavily. And the Egyptians said, "Let us flee from before Israel, for the LORD fights for them against the Egyptians." 26Then the LORD said to Moses, "Stretch out your hand over the sea, that the water may come back upon the Egyptians, upon their chariots, and upon their horsemen." 27So Moses stretched out his hand over the sea, and the sea returned to its normal course when the morning appeared. And as the Egyptians fled into it, the LORD threw the Egyptians into the midst of the sea. Notice, it was the Angel of God in verse 19 who stood between the Israelites and the pursuing Egyptians, providing light for the Israelites and darkness to the Egyptians; and in verse 24 we are told it was "the LORD in the pillar of fire and of cloud". 20"Behold, I send an angel before you to guard you on the way and to bring you to the place that I have prepared. 21Pay careful attention to him and obey his voice; do not rebel against him, for he will not pardon your transgression, for my name is in him. 22But if you carefully obey his voice and do all that I say, then I will be an enemy to your enemies and an adversary to your adversaries. 24you shall not bow down to their gods nor serve them, nor do as they do, but you shall utterly overthrow them and break their pillars in pieces. The importance, power, authority, and deity of the Angel of the Lord are vividly portrayed in this passage. God, Himself, said, "My name is in Him." He told Moses to listen to and to obey this Angel, for He [the Angel] would not pardon the people's transgressions. This statement tells us clearly that the Angel was God because only God has the ability to pardon sins. Jesus' biggest obstacle or point of contention between Himself and the Jews during His brief time on earth was that He was able to forgive sins, for they rightly believed that no one could forgive sins except God. They considered Jesus to be a blasphemer for comparing Himself to God on this issue. Had they only realized that, in actuality, it was God in their midst who was offering forgiveness, how differently things might have gone! While Moses was on the mountain speaking with God and receiving the Commandments, the people below grew restless and impatient, and were overtaken by sinful lusts and desires. They fashioned a metal [golden] god of their own design and worshiped it. God was angry and promised to bring punishment upon the guilty, but once again, mercifully allowed the Angel of the Lord to lead His people, proving that the guilty will not go unpunished, but the innocent will benefit from God's mercy. God placed a limitation upon the guidance the Angel would provide for Moses and his people. The Angel would show the way and drive out the enemies from the Promised Land, but He would not be among the people because of their stubborn ways. After Moses passionately interceded on behalf of the Israelites, reminding God that they are His chosen people apart from the rest of the people on earth, God relented and assured Moses of His commitment to them, and that His Presence [the Angel] would go with them. 12"Moses said to the LORD, 'See, you say to me, "Bring up this people," but you have not let me know whom you will send with me. Yet you have said, "I know you by name, and you have also found favor in my sight." 15And he said to him, 'If your presence will not go with me, do not bring us up from here. How many of us would be so bold or so confident in God's great mercy and grace to pray, "If your presence will not go with me, then I will not go" [paraphrased]? How many problems or struggles might we avoid if we would learn to wait for the Presence and power of the Lord going before us! In this unique passage of Balaam and his talking donkey, Balaam's donkey saw the Angel of the Lord and tried to steer his master away from the Angel's drawn sword. The donkey, no doubt, sensed the imminent danger for his master and tried to protect him, even though his master beat him. 21So Balaam rose in the morning and saddled his donkey and went with the princes of Moab. 22But God's anger was kindled because he went, and the angel of the LORD took his stand in the way as his adversary. Now he was riding on the donkey, and his two servants were with him. 23And the donkey saw the angel of the LORD standing in the road, with a drawn sword in his hand. And the donkey turned aside out of the road and went into the field. And Balaam struck the donkey, to turn her into the road. 24Then the angel of the LORD stood in a narrow path between the vineyards, with a wall on either side. 25And when the donkey saw the angel of the LORD, she pushed against the wall and pressed Balaam's foot against the wall. So he struck her again. 26Then the angel of the LORD went ahead and stood in a narrow place, where there was no way to turn either to the right or to the left. 27When the donkey saw the angel of the LORD, she lay down under Balaam. And Balaam's anger was kindled, and he struck the donkey with his staff. 31Then the LORD opened the eyes of Balaam, and he saw the angel of the LORD standing in the way, with his drawn sword in his hand. And he bowed down and fell on his face. 32And the angel of the LORD said to him, 'Why have you struck your donkey these three times? Behold, I have come out to oppose you because your way is perverse before me. It's both humorous and sad when you think about it. The donkey knew better than Balaam how futile and dangerous it is to oppose the Lord! As a result of the Israelites not driving out the Jebusites, Canaanites, and other pagans living in the Promised Land  but in fact, made covenants with them  the Lord became angry. He reminded them of how He had brought them to the Promised Land. He didn't break His covenant with the people, but they didn't follow through with their part, so God told them He would no longer drive away their enemies from before them. They [the enemies] would become a reminder of a broken promise . . . a thorn in their flesh. Being severely persecuted by the Midianites, the Israelites cried out to God for deliverance. After some hesitation on His part, God sent His Angel to a very unlikely person to deliver Israel from the Midianites. 11"Now the angel of the LORD came and sat under the terebinth at Ophrah, which belonged to Joash the Abiezrite, while his son Gideon was beating out wheat in the winepress to hide it from the Midianites. 17And he said to him, 'If now I have found favor in your eyes, then show me a sign that it is you who speak with me. 19So Gideon went into his house and prepared a young goat and unleavened cakes from an ephah of flour. The meat he put in a basket, and the broth he put in a pot, and brought them to him under the terebinth and presented them. 20And the angel of God said to him, 'Take the meat and the unleavened cakes, and put them on this rock, and pour the broth over them.' And he did so. 21Then the angel of the LORD reached out the tip of the staff that was in his hand and touched the meat and the unleavened cakes. And fire sprang up from the rock and consumed the meat and the unleavened cakes. And the angel of the LORD vanished from his sight. If we continue reading the narrative, we find that with only 300 men, God defeated and expelled the Midianites (cf. Judges 7:7-25). Even when the odds heavily outnumber us, God is with us. And God expects a great deal from even the least of us . . . from the most unlikely . . . even from those who don't feel confident to do the things that God asks of us. As we learned in the lesson "Jesus Portrayed in the Old Testament", during the times of the judges, Israel repeatedly sinned against the Lord. This brought about God's stern discipline, which resulted in their repentance, at which time He would raise up a deliverer from among them. After the woman told her husband what had happened, he prayed and asked the Lord to send the "man of God" again. The Lord graciously granted Manoah's request, and the Angel of the Lord appeared to his wife again. She ran to get her husband who quickly followed her to where the man was, and Manoah asked the man what the child's purpose was to be. 13"And the angel of the LORD said to Manoah, 'Of all that I said to the woman let her be careful. 19So Manoah took the young goat with the grain offering, and offered it on the rock to the LORD, to the one who works wonders, and Manoah and his wife were watching. 20And when the flame went up toward heaven from the altar, the angel of the LORD went up in the flame of the altar. Now Manoah and his wife were watching, and they fell on their faces to the ground. 21The angel of the LORD appeared no more to Manoah and to his wife. Then Manoah knew that he was the angel of the LORD. Once again, God had chosen someone who might initially appear to be an unlikely candidate to do His work. So much did God want a special child named Samson to be born, that He sent His Angel to announce the pregnancy. As with Abraham's wife, Sarah, and Zechariah's wife, Elizabeth in the New Testament, so also was Manoah's wife blessed. These three formerly-barren women did bear children: Isaac, John the Baptist, and Samson respectively. Each of these pregnancies defied human rationale, but God provided especially for them to fulfill His purposes through them. Satan had convinced David that he needed to "number" the people [take a census], even though Joab strongly advised against it. I will attempt here only a cursory explanation that I believe is well supported by Scripture. As we know, in Job's life, God allowed Satan to attempt all manner of evil and sorrow against Job in an effort to get him to renounce his God. Scripture reminds us time and again that God permits Satan certain liberties in His children's lives. But these are only to ultimately accomplish God's will in the long-run. After reading all the relevant passages, I believe the narrative in 1 Chronicles provides the correct rendering. In verse 1 we find that "Satan stood against" or "rose up against" Israel and "incited [caused] David" to take a census.David's trusted friend and advisor, Joab, did not want to follow David's orders at all, because he knew it didn't seem right with God. The King insisted on a census, so one was taken; however, Joab purposely did not take a complete census [as he did not include the children]. After David completed the census] as revealed to us in 2 Samuel 24 and 1 Chronicles 21, the Lord's anger was aroused against him. Through the Prophet Gad, God gave David three choices of punishment; and the Lord sent a pestilence upon Israel that resulted in the deaths of 70,000 men. However, in His great mercy, God relented to continue the destruction. He instructed the angel who had been smiting the people to stop the destruction. When David saw the Angel of the Lord standing between heaven and earth with His sword drawn (v. 16), he immediately realized he had done something truly against God. In v. 17, David confessed his sin and asked God to punish him and his family and not the innocent ones. Why was the census unlawful? Because it indicated that David had been relying on the number of his warriors, rather than on God. Although Satan prompted David to seek the census, one positive end result was that it caused David to purchase the land on which the Temple would be built. There are many times when we may think we know what is best, even though it is not necessarily in line with God's directives, and even when our closest friends and advisors disagree with us. And often, our poor choices and bad decisions can adversely affect the lives of others. Many suffered because of David's leadership, or lack of it, in this event. However, God knew when to intervene and He commanded the Angel of the Lord to return His sword to its sheath, and stop the destruction. The angel who had been killing the people appears to be the same Angel standing by the threshing floor. As soon as David saw the Angel of the LORD, he began praying for mercy upon the people. God heard David's prayer and commanded the angel to stop, just as the Angel of the Lord stayed Abraham's hand in Genesis 22:11-12. Following the Lord's spectacular display of power in 1 Kings 18, giving Elijah victory over the prophets of Baal, Elijah fled from Queen Jezebel's wrath. We find him in 1 Kings 19, wearied from his flight and praying to die. 6And he looked, and behold, there was at his head a cake baked on hot stones and a jar of water. And he ate and drank and lay down again. Of course, there's much more to this narrative than I have written above, but for this particular lesson it is enough. There's a very significant phrase used in the quoted text above. Did you see it? In verses 5 and 7, we're told "an angel" and "the angel of the LORD" came to Elijah. But in verse 9, we see the "word of the LORD" speaking to Elijah! Perhaps it is by this authority that the Apostle John was able to discern and write: "In the beginning was the word, and the word was with God, and the word was God." (John 1:1 emphasis added) This could only mean a distinct Person of the Godhead. Many times we have heard of a mighty nation overpowering another, and simply destroying it with little effort. Sennacherib, the king of Assyria, had destroyed much and killed many, and had become mighty (cf. 2 Kings 18:9-19:13). Although God had assisted Sennacherib in battle, God still recognized him as an evil man who worshipped another god. Thus, He sent the Angel of the Lord to destroy 185,000 in the camp of the Assyrians in one night. "And that night the angel of the LORD went out and struck down 185,000 in the camp of the Assyrians. And when people arose early in the morning, behold, these were all dead bodies. Then Sennacherib king of Assyria departed and went home and lived at Nineveh. And as he was worshiping in the house of Nisroch his god, Adrammelech and Sharezer, his sons, struck him down with the sword and escaped into the land of Ararat. And Esarhaddon his son reigned in his place." (2 Kings 19:35-37 emphasis added). As you read this story, keep in mind that God can bless whomever He pleases, but He specifically says that we can love no other god before Him. As a consequence of serving a false god, the king of Assyria suffered the wrath of the one true God for his "raging against God" (v. 27). See the parallel narrative of God's deliverance and the death of the Assyrian king in Isaiah 37:31-38. 4"I sought the LORD, and he answered me; he delivered me from all my fears. 5Those who look to him are radiant; their faces are never covered with shame. 6This poor man called, and the LORD heard him; he saved him out of all his troubles. This psalm reminds us that the Lord is gracious and sufficient to deliver us from all of our fears. He is faithful to hear our prayers when we call upon Him. This passage speaks of the Angel of the Lord as being able to deliver those who fear Him, and He likewise encamps around them. We believers know that Jesus is the true Deliverer. This passage is one of many which causes us to consider the distinct possibility that the Angel of the Lord and Jesus Christ, the second person of the Godhead, are indeed one in the same Person. The religious rulers and leaders of Jesus' time on earth accused Him of being a blasphemer, a crime punishable by death. Their reason: No one could forgive sins except God Almighty. This passage speaks of God's great love for His chosen people and the faith He had in them. But they rebelled and grieved His Holy Spirit, causing Him to turn against them, to discipline their bad behavior. As we've already studied in the previous lesson, God took His Presence, or the Angel of the Lord, from them for a time, so they could not easily defeat their foes and would return to Him. It would be difficult to find anyone today who does not know the story of the three Hebrew boys who refused to worship Babylon's god or the golden idol. Even most non-Christians know the story. The three condemned men in this passage were devout believers in God, so much so that they were willing to go to their deaths rather than renounce the one true God. However, God spared their lives by sending His own Angel to their rescue, which caused a nationwide testimony to the supremacy of God Almighty, for all of the citizens to take notice of the God of Shadrach, Meschach, and Abednego. 20"And he [the king of Babylon] ordered some of the mighty men of his army to bind Shadrach, Meshach, and Abednego, and to cast them into the burning fiery furnace. 21Then these men were bound in their cloaks, their tunics, their hats, and their other garments, and they were thrown into the burning fiery furnace. 22Because the king's order was urgent and the furnace overheated, the flame of the fire killed those men who took up Shadrach, Meshach, and Abednego. 23And these three men, Shadrach, Meshach, and Abednego, fell bound into the burning fiery furnace. 25He answered and said, 'But I see four men unbound, walking in the midst of the fire, and they are not hurt; and the appearance of the fourth is like a son of the gods." 26Then Nebuchadnezzar came near to the door of the burning fiery furnace; he declared, 'Shadrach, Meshach, and Abednego, servants of the Most High God, come out, and come here!' Then Shadrach, Meshach, and Abednego came out from the fire. 27And the satraps, the prefects, the governors, and the king's counselors gathered together and saw that the fire had not had any power over the bodies of those men. The hair of their heads was not singed, their cloaks were not harmed, and no smell of fire had come upon them. 28Nebuchadnezzar answered and said, 'Blessed be the God of Shadrach, Meshach, and Abednego, who has sent his angel and delivered his servants, who trusted in him, and set aside the king's command, and yielded up their bodies rather than serve and worship any god except their own God. What a powerful witness their devotion to God was to the people of Babylon! Here is another story with which most people are familiar. Daniel's enemies plotted against him by tricking the king of Babylon into issuing a non-revocable decree making it illegal for anyone in the kingdom to pray to any god but his false god (cf. Daniel 6:6-9). Being a devout Jew and fully trusting in the Lord's mercy and protection, however, Daniel continued to pray at his window three times a day (cf. Daniel 6:10). As with the story of Shadrach, Meshach and Abednego, God reversed the death decree. King Darius, who had condemned Daniel, suffered tremendous guilt about the sentence of death until he learned that Daniel had not been harmed. Daniel spent the night in a den of ferocious and hungry lions and came out the next morning without even one scratch. 19"Then, at break of day, the king [Darius] arose and went in haste to the den of lions. 21Then Daniel said to the king, 'O king, live forever! We know the lions were, in fact, hungry man-eaters because Daniel's accusers and their families were brutally attacked and killed immediately after they were thrown into the same lion's den (cf. Daniel 6:24). Having personally witnessed God's angelic intervention in Daniel's life, this ruler also then began to fear the Almighty God of Israel (cf. Daniel 6:25-27). The prophet Zechariah had several intense visions wherein he saw the Angel of the Lord as well as other created angels over whom the Angel of the Lord had charge. In these visions, Zechariah learned about God's plans for Israel and the end times. In the first chapter of this prophetic book, Zechariah tells us he saw a man riding a red horse with many red, reddish-brown, and white horses behind him. When he asked the man who they were, the man said God selected them to "patrol the earth." (cf. Zechariah 1:10). In verse 11, the text makes it clear that the "man who was standing among the myrtle trees" was the Angel of the Lord. 1"And I lifted my eyes and saw, and behold, a man with a measuring line in his hand! 4and said to him, 'Run, say to that young man, "Jerusalem shall be inhabited as villages without walls, because of the multitude of people and livestock in it. 6Up! Up! Flee from the land of the north, declares the LORD. For I have spread you abroad as the four winds of the heavens, declares the LORD. 7Up! Escape to Zion, you who dwell with the daughter of Babylon. 9'Behold, I will shake my hand over them, and they shall become plunder for those who served them. Then you will know that the LORD of hosts has sent me. 10Sing and rejoice, O daughter of Zion, for behold, I come and I will dwell in your midst, declares the LORD. that the people will gather around this Messenger and shall know and recognize Him as the One sent by God, Himself. Zechariah 3:1-8 vividly illustrates the awesome and exalted position of the Angel of the Lord. He speaks of bringing forth His Branch (v. 8), which of course, is our Lord and Savior, Jesus Christ. All of this occurred as Joshua stood in judgment before the Angel of the Lord while Satan stood at Joshua's side to try to accuse him. We know who the Branch is of whom the Angel spoke of, and we also know who the one true Judge is before whom we all will stand one day. Of course, it's Jesus Christ, our risen Savior. And don't forget, all of this occurred long before Jesus was born in the flesh. This passage vividly describes the ultimate authority of Christ as the One who forgives and is also the one true Lawgiver as mentioned in the book of Revelation. He is the Commander of the Heavenly Host, who led God's army around the wall at Jericho and who stood before Joshua, advising him to remove his sandals because the ground on which he was standing was holy ground [as was the case with Moses at the burning bush]. Following the prophetic utterances of Zechariah, there is no indication in Scripture that the Angel of the Lord ever appeared again after the birth of Jesus Christ. This would lead us to reason and conclude that, just as Jesus Christ was/is the Presence of God to His children in the New Testament and beyond, the Angel of the Lord is the Presence of God to His children in the Old Testament. In other words, the Angel [or Messenger] of the Lord in the Old Testament is the same Jesus Christ, God Incarnate, in the New. 1The Amplified Bible, Expanded Edition, pg. 18; copyright ©1987, Zondervan Corporation. 3Meroz  n. A plain in the north of Palestine, the inhabitants of which were severely condemned because they did not help Barak against Sisera. It has been identified with Marassus, on a knoll to the north of Wady Jalud, but nothing is really known of it. Like Chorazin, it is only mentioned in Scripture in connection with the curse pronounced upon it. 4The Amplified Bible, Expanded Edition, ©1987, Zondervan Corporation. 4The Amplified Bible, Expanded Edition, Johan P. Lange, "A Commentary", ©1987, Zondervan Corporation.